Man that's a long title. Heh. Hello, everyone! It's wine night and I am BLOGGING. I'm telling you, this is a solid get-back-to-blogging plan. A little bit (LOL) of wine goes a long way! Anyway. 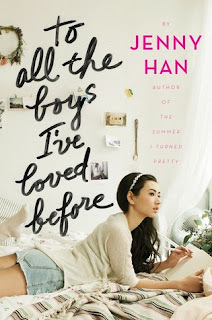 Tonight I'm sharing my thoughts on a sorta oldie by goodie: To All The Boys I've Loved Before by Jenny Han. I was only supposed to review the second book tonight but when I searched for my review of the first book I discovered that I have no such post! How on earth have I not reviewed that yet?! Shocking, I tell ya. I raved on and on on Twitter and Facebook but no review. I am a disgrace. No worries though because HERE IT IS! So. I'm not gonna lie. The only reason why I fell madly in love with the book is Peter Kavinsky a.k.a. your dreams come true. Sort of. He's a fictional character but let's say Jenny Han heard our prayers and created him for all of us. Now, he's not perfect but he added that oompf to a story that badly needed it. 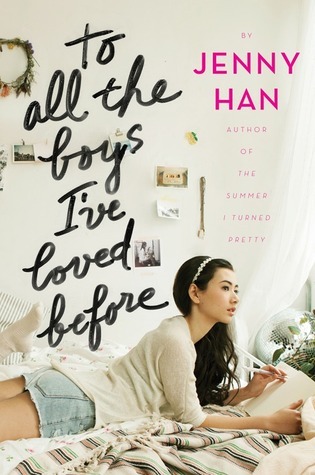 If you're a first time Jenny Han reader, it could take a bit of getting used to. When I read her Summer trilogy, I found that her writing's choppy but you can get the hang of it. I can't guarantee you'll enjoy the story but at least you can get past the writing style. This is the same case when I started To All The Boys. I was starting to give up on the book because I felt that sentences ended abruptly and scenes were not fluid enough. It also didn't help that Lara Jean is so difficult to like. She's supposedly a 16 year old but her behavior made her sound waaaay younger. It's so hard reading a book whose narrator is naive and whiny. A lot of her problems could've been solved if she woman-ed up a bit, you know? I know that once upon a time we all went through that as teenagers. But I just can't read chapter after chapter of barely any growth from a protagonist who could seriously use it. You have to show readers that the narrator is improving, otherwise what's the point? Lara Jean almost made me want to DNF the book. However! I powered through. And it's a good thing I did because man oh man, ALL THE FEELS. Not a lot of people know this but I have a thing for the fake boyfriend trope. I can't resist it! Say what you want but we all have our guilty pleasures and you know it. ;) Basically, Peter and Lara Jean pretend to be boyfriend and girlfriend, goes through all the couple-y things they could possibly do in public (within the bounds of their contract of course), and eventually they found themselves liking each other and making their relationship real. It all sounds cliché — it is — but you won't even mind because the romantic gestures are lowkey and plain romantic. There aren't any grand declarations of love (well at least none that compares to other cheesy books) so this is right up my alley. I have mad appreciation for books that keep it simple but can still manage to capture your heart. I went into this expecting romance and I got just that. The key here is to not overthink and just enjoy. I mean, so what if I don't really like Lara Jean and Peter Kavinsky is basically the only reason why I love this book? Well at least there's a second book and I can find more reasons to like this series more in that one. Right? Right. More on the sequel on my next post! For now it's time for bed. The wine has successfully made me sleepy. Ya'll have a good night (or morning).